10. The Engagement Ring: Crown Prince Haakon presented Mette-Marit with an especially sentimental royal ring when he proposed -- it's been worn by three generations of Norwegian royal women. King Olav V gave the ring to Princess Martha of Sweden when they were engaged in 1929, and their son (and Haakon's father), King Harald V, gave it to Sonja Haraldsen (Haakon's mother) in 1968. The yellow gold ring is set with diamonds and rubies. 9. 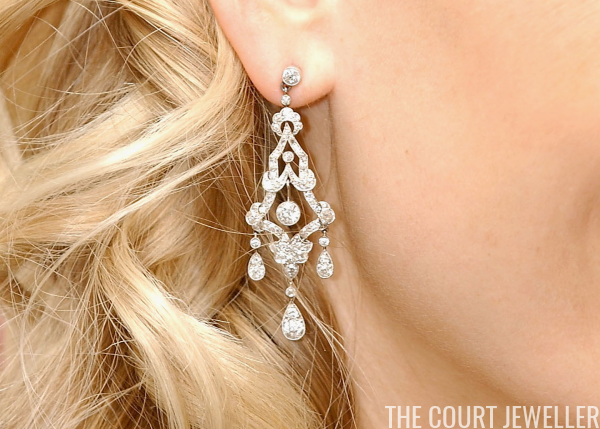 The Convertible Diamond Earrings: For gala events, Mette-Marit often reaches for this versatile pair of earrings, which feature a diamond pendant that can be worn at various lengths and with different pendants. 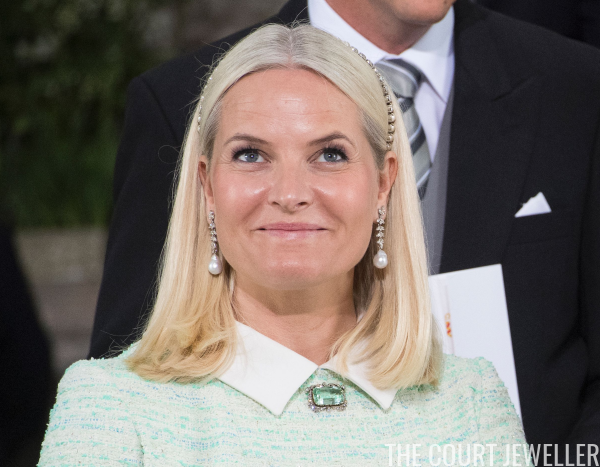 Above, a red faceted gemstone pendant is attached to the earrings, but Mette-Marit also frequently wears the earrings with pearls. 8. The Wedding Gift Pearls: Crown Prince Haakon reportedly presented Mette-Marit with this suite of classic pearls as a wedding gift; the set also includes a bracelet. 7. 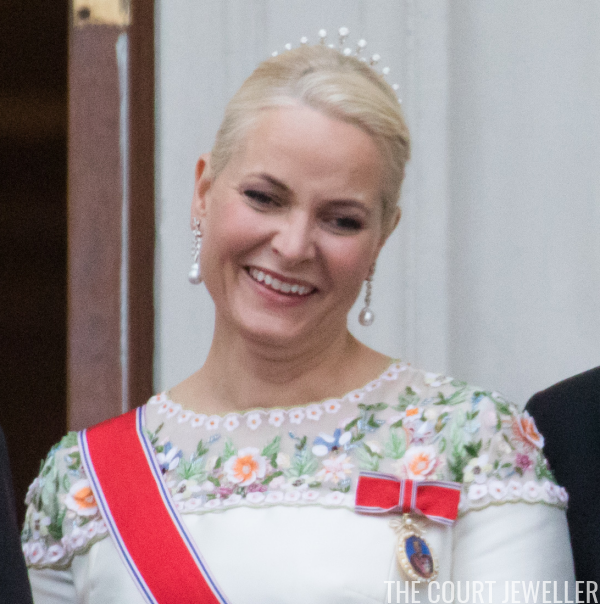 The Amethyst Suite: Mette-Marit is now the primary wearer of the family's amethyst and diamond demi-parure, which features a necklace that can be worn as a tiara. The set was originally a gift from King Harald to Queen Sonja. 6. The Floral Statement Earrings: This pair of sparkling earrings, one of the largest and most complicated in Mette-Marit's jewelry box, are designed with an embellished floral motif. 5. 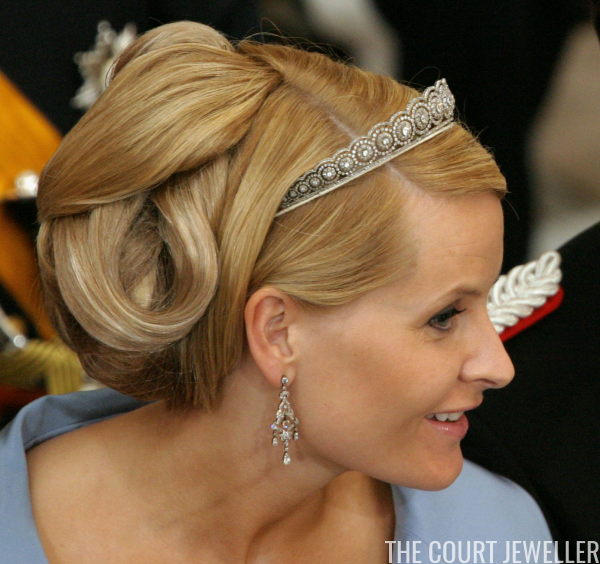 The Diamond Daisy Bandeau: Mette-Marit's wedding tiara, a sparkling Edwardian bandeau featuring dainty daisies, was a gift from her parents-in-law, King Harald and Queen Sonja. 4. The Aquamarine Brooch: This classic brooch features a rectangular sea-green aquamarine surrounded by a delicate frame of scrolling diamonds. 3. The Vifte Tiara: Mette-Marit has worn this delicate, fan-shaped diadem, which was one of Queen Maud's wedding gifts, as both a necklace and a tiara. 2. Queen Maud's Pearl Tiara and Drapers' Company Brooch: This pair of jewels linked to Queen Maud, including a diamond and pearl brooch from among her wedding gifts and a replica of her diamond and pearl tiara, were worn by Mette-Marit for the grand Swedish royal wedding in 2010. 1. 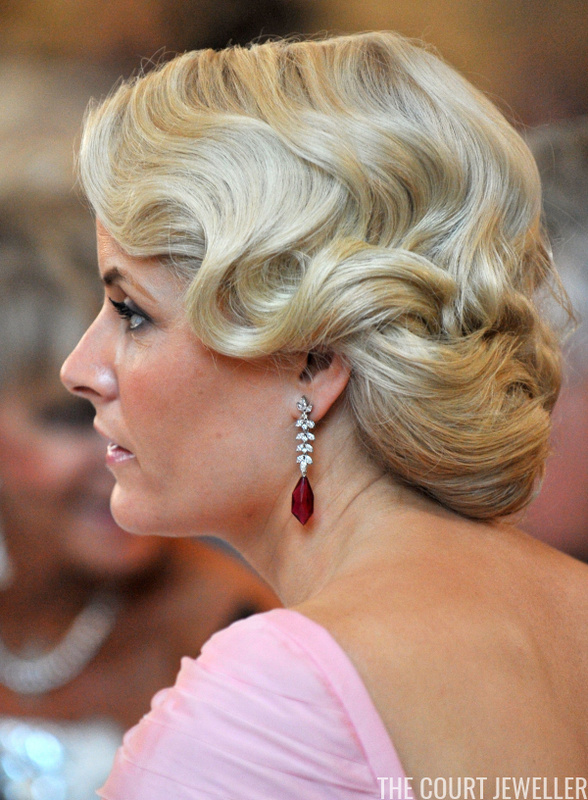 The Silver Wedding Earrings: This remarkable pair of diamond earrings, which were a silver wedding anniversary gift from King Olav V to Crown Princess Martha, were given to Mette-Marit by King Harald and Queen Sonja as a wedding present. 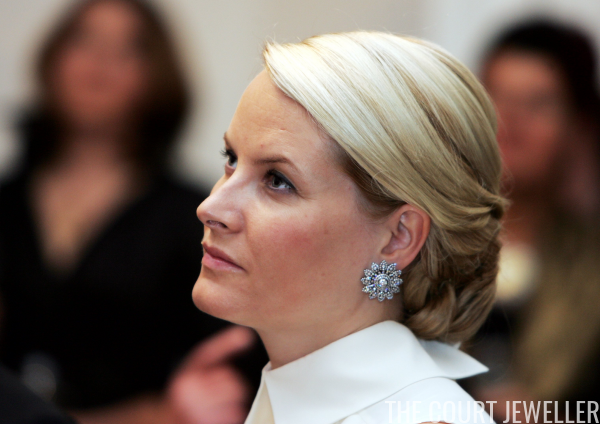 Poignantly, Martha was never able to wear the earrings in public, as she died a month after her silver anniversary, but they have become some of Mette-Marit's favorite jewels.